This was definitely NOT an exciting food day. I tried some things that I don’t think really worked, and if I had to eat this way every day, I may abandon the whole BLE idea! But I think this is a good lesson in life. Some days are better than others and sometimes you just have to get through the day. 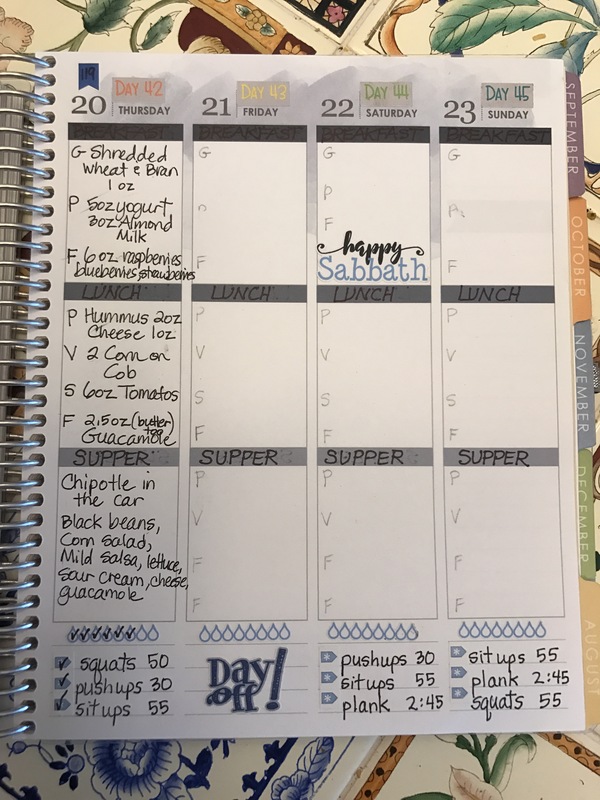 For me, I just got through the meals today! When I got started with BLE I bought a bunch of different plain yogurts to see which ones I liked best. I’d heard a lot of buzz about Greek yogurt so that was one that I had purchased. The first time I ate Greek yogurt, I don’t think I was able to finish it. 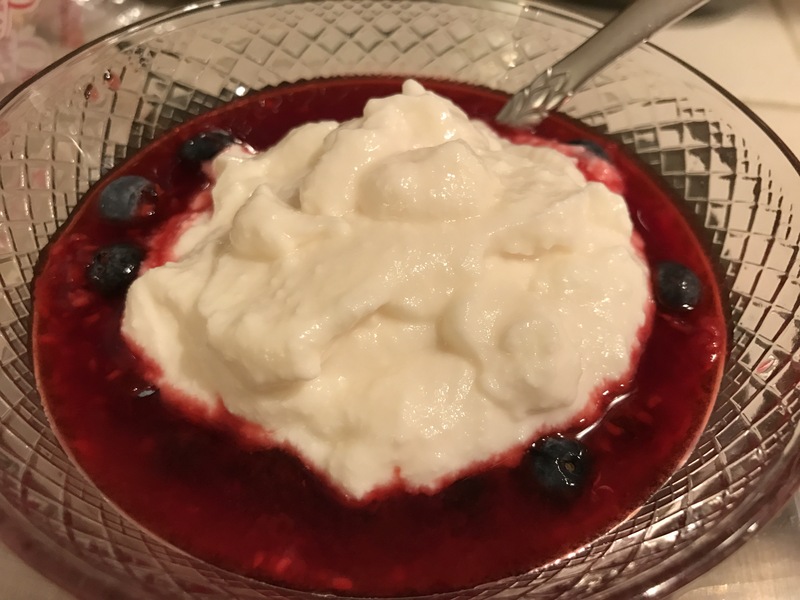 After being used to yogurts with sugar, Greek yogurt was just – yuck!! But I wanted to see if there was anything I could do to make it more palatable. 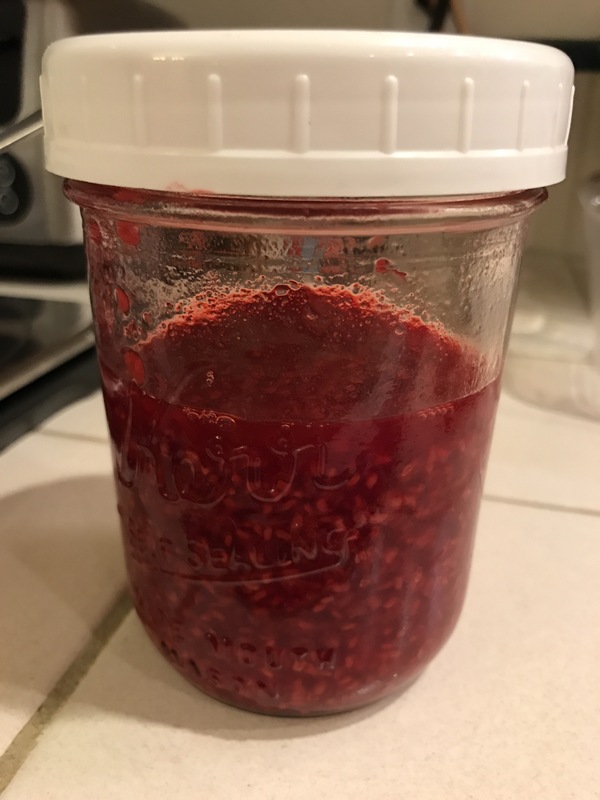 This is what the raspberries looked like in a jar. It was pretty “soupy” but didn’t taste like any sugar was added. I also don’t think it was a jam or anything. 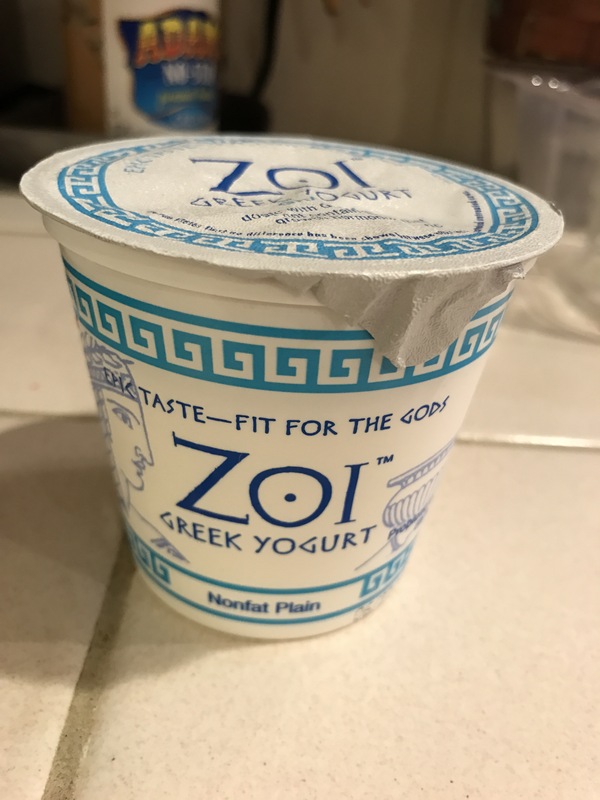 The truth is, I don’t remember when it was frozen but I wanted to see if there was a way that I could use it to make the Greek yogurt taste a lot better! This is the Greek yogurt that I could barely get down. 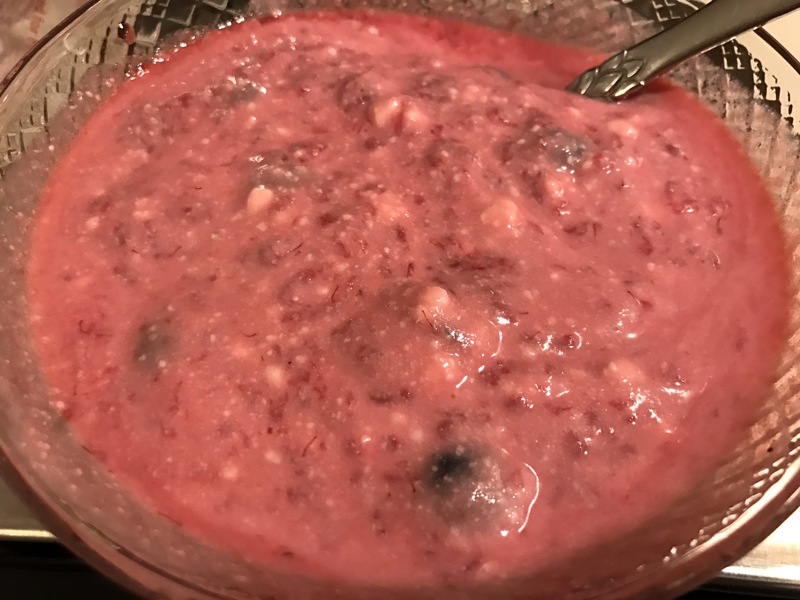 I took 6 ounces of the berry combination (which was mostly the raspberries) and mixed it with the whole container of yogurt which was I believe was also 6 ounces. Um, I think it looked better before it was mixed. I covered it with plastic wrap and popped it into the fridge to cool overnight. The next morning came and here was my pre-planned food day! 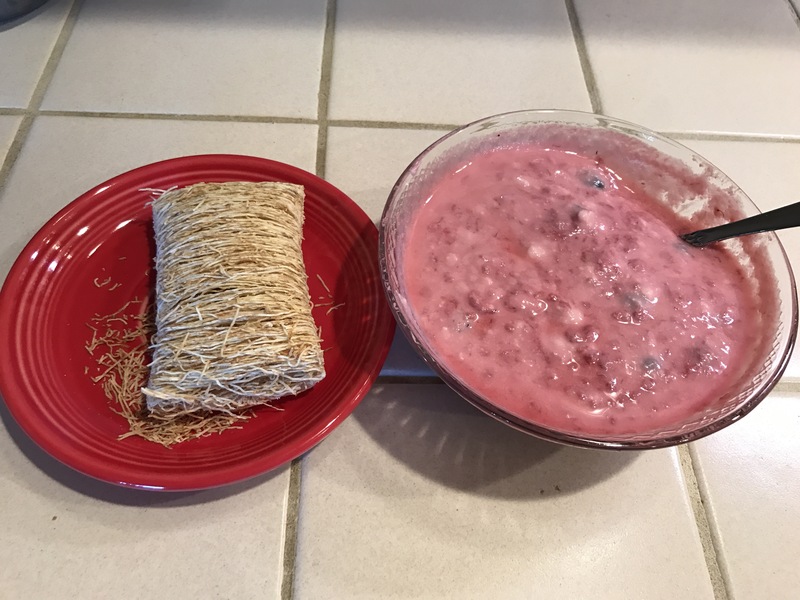 For breakfast I grabbed my yogurt mix, which did look better the next morning and used my Shredded Wheat as a sort of topping on it. I call these little wheat “bales” because they remind me of bales of straw. Surprisingly, they don’t taste as blah as what I imagine straw would taste like, but that is probably due to the fact that my dad always ate this while i was growing up, so I learned to like them (but with honey). 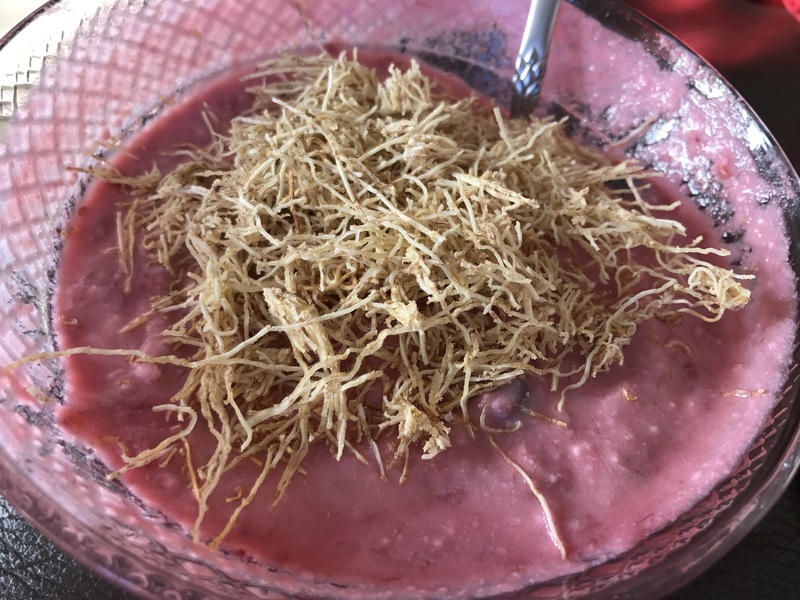 Even so, it is one of my go-to breakfast cereals, so using it as a topping for my yogurt mixture seemed like a good idea. It wasn’t the most glorious breakfast, but it wasn’t awful. Just not maybe something I would try again. And this takes us to lunch, another “recipe” I would not do again! 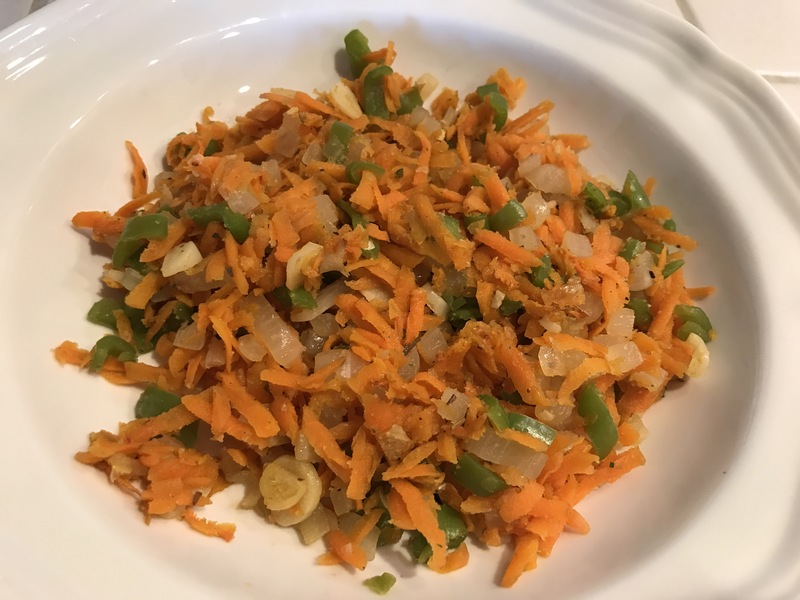 I sautéed peppers, garlic, onions, and carrots together to create a sort of base for the white beans from a can. When I put the beans on, it was kinda like, “this needs something else”!! So I went out to my bucket garden on my porch and grabbed a few sprigs of parsley and lemon leaves. That made it look a lot better, but the honest truth is I had to muscle my way through this food because it just didn’t taste that great. I think I used too much garlic, and maybe not enough salt. I don’t really know. I just know that I would not do this again. 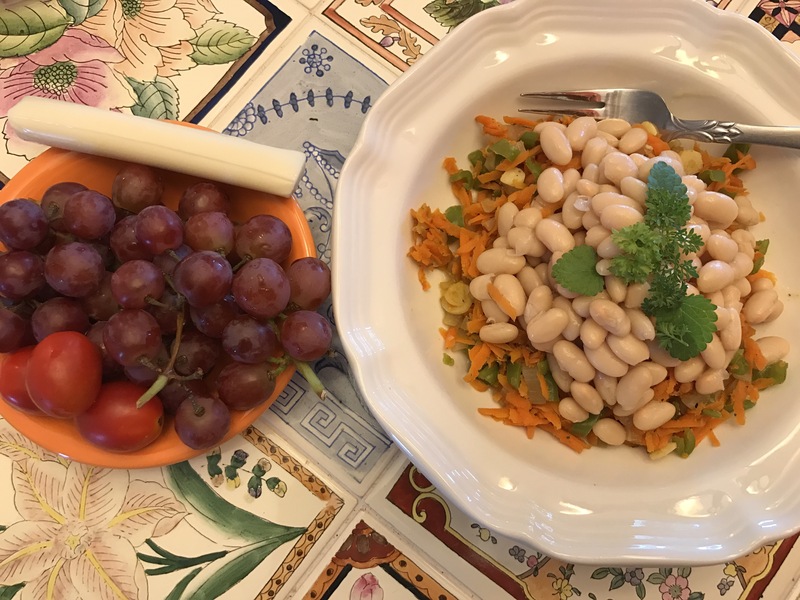 I was glad for the grapes and tomatoes and cheese because I saved them for last and ended my meal with food that was more enjoyable. 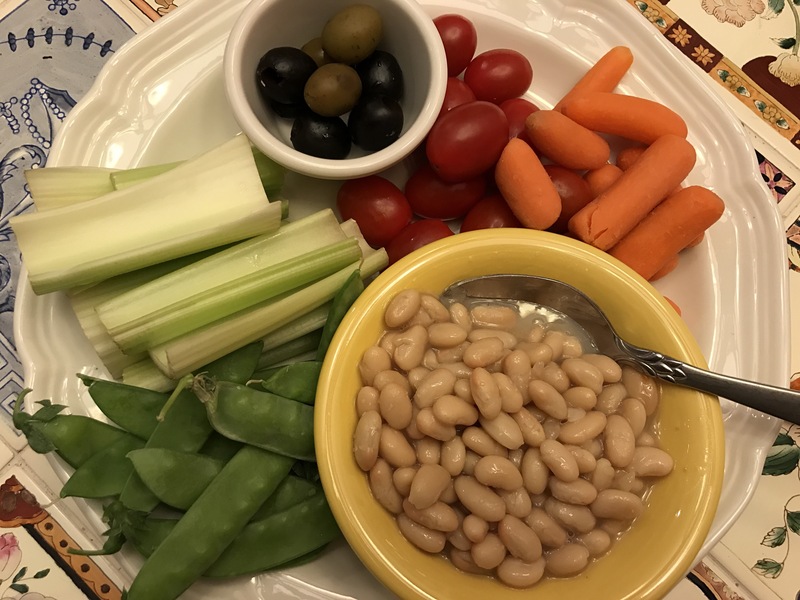 Supper found me tired and unmotivated to do anything creative, so I ate the rest of the beans, which was another 6oz, and then just filled out the meal with raw veggies. While it was mostly the same foods as lunchtime, I tasted a lot better just boring and raw!! And that wrapped up my day! 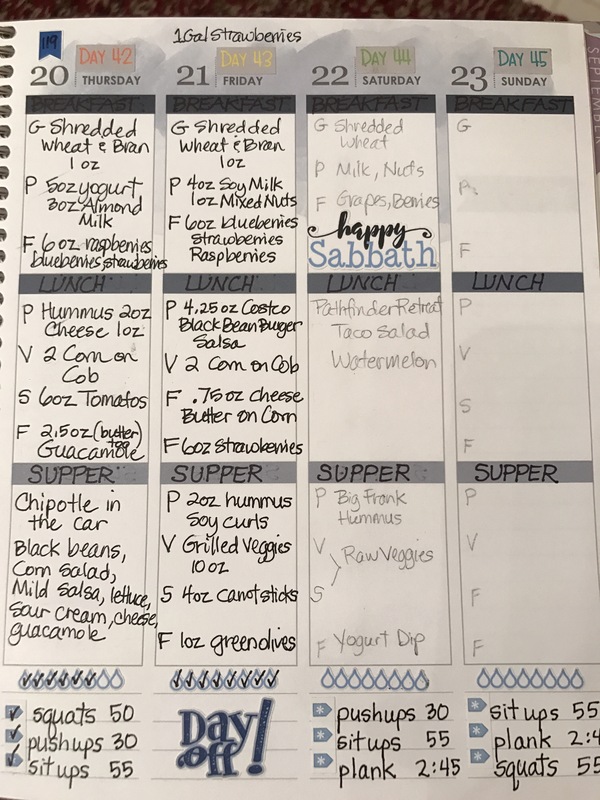 And a note about the food being meh…if I was truly hungry, I would be thrilled with this day of food and eat every drop with no complaints whatsoever!! I think it’s good to know that there will be times on this BLE journey where the food may not be your favorite. But that’s ok. There is always another day. 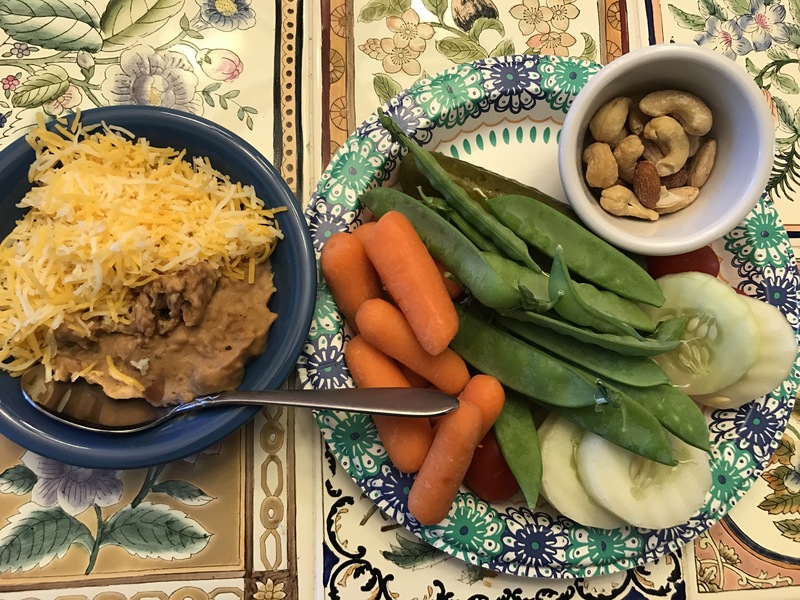 This entry was posted in Bright Line Eating, KMc's Kitchen on July 25, 2017 by gracewithouttears. 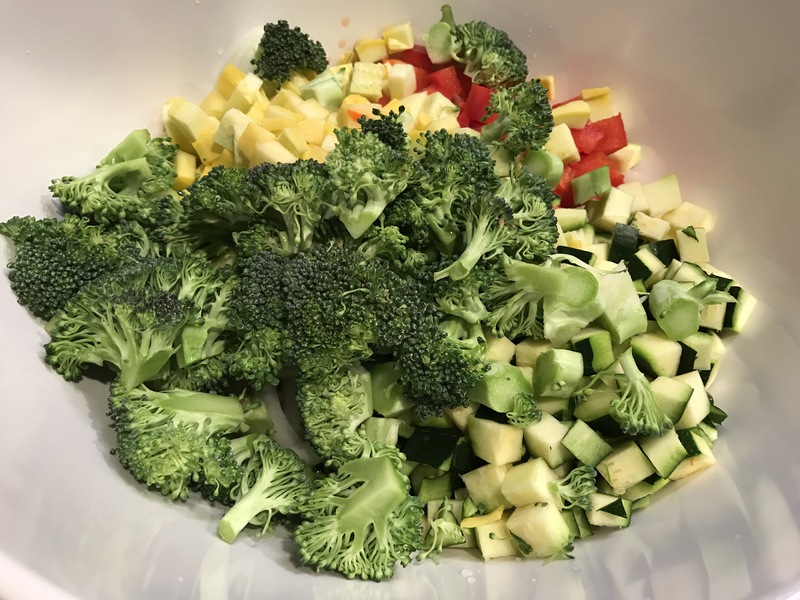 On Day 43 I ate a dish of grilled veggies for supper. 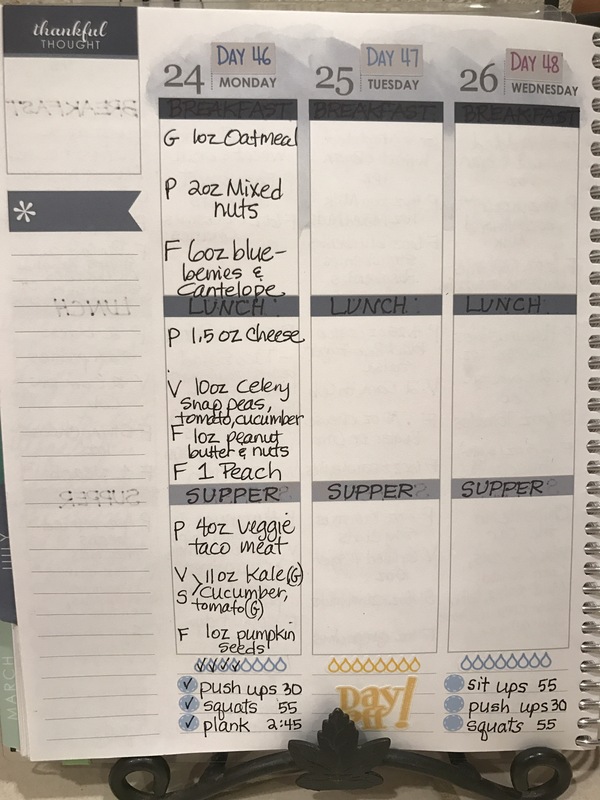 I’ve had some questions about how I prepared them so I wanted to take a minute and share the process. 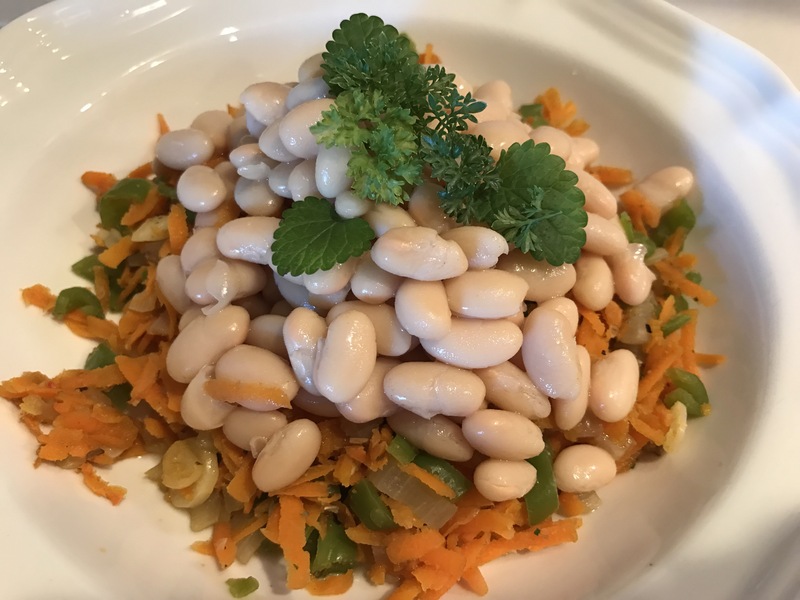 The recipe comes from one of my favorite cookbooks called “7 Secrets”, by Neva Brackett. I’ve made it many times and mostly we’ve eaten it as a burrito wrap. My family still enjoys it that way, but I just eat it without the flour tortilla and it stands perfectly well on its own. 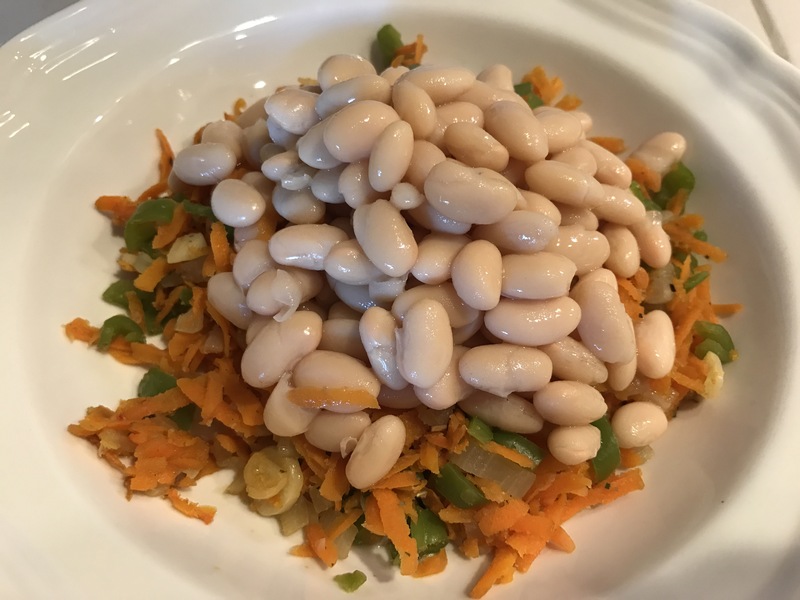 I don’t know if I can share the exact recipe here in the blog, but this post will give you a good idea of how I prepared the basic recipe. It was part of my supper meal on Day 43. I discovered mason jar storage a few days ago so I’ve been putting everything i can into mason jars to see how well things hold up. 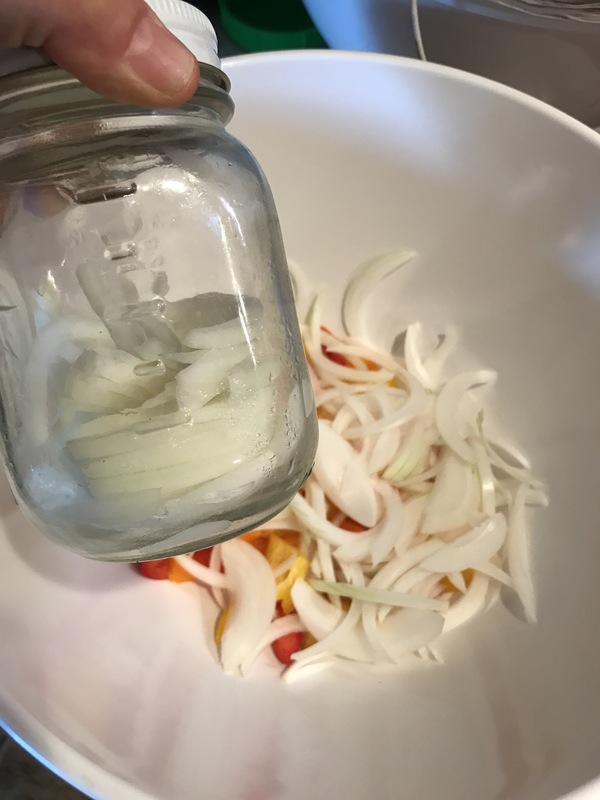 I already had these onions cut and in the jar, so it was super quick and easy to grab them and throw them into my recipe. 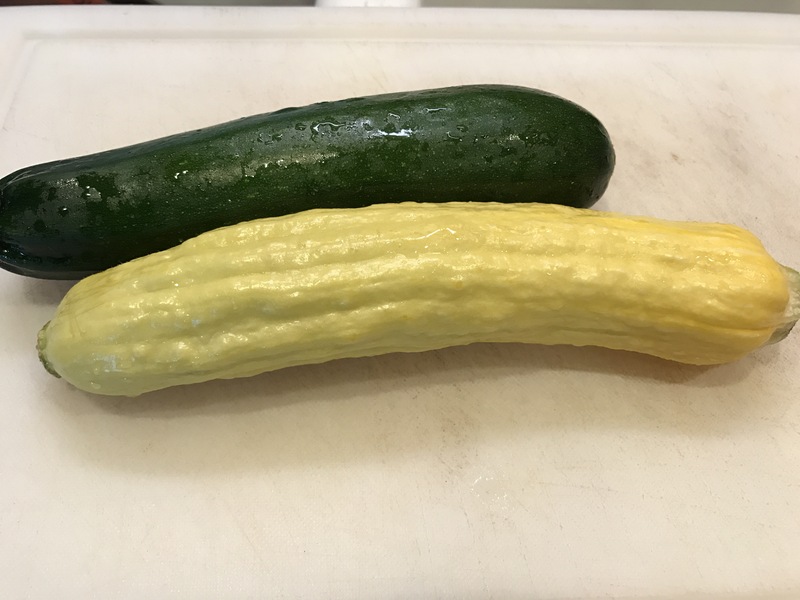 My zucchinis are almost ready to harvest so I hope this is the last one (these are organic) that I’ll have to buy from Costco. 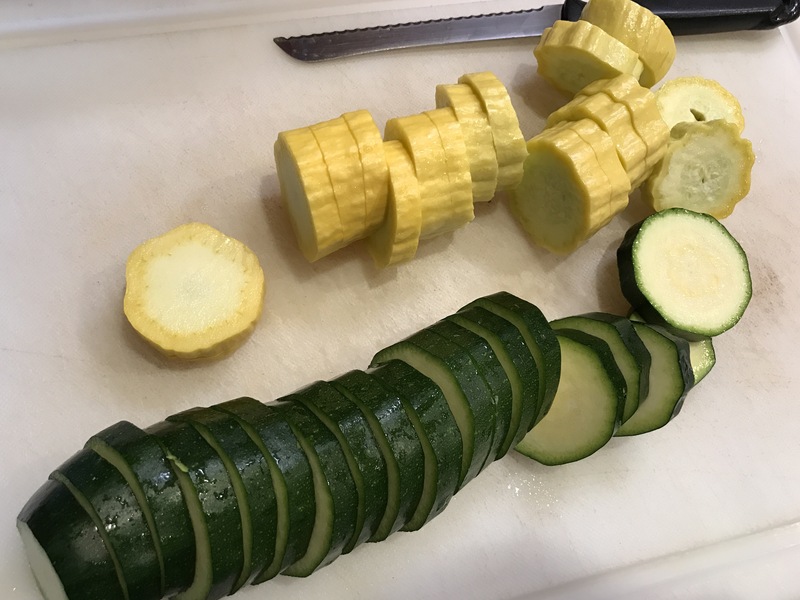 The yellow summer squash is from the garden at the elementary school and I love knowing that my food is coming straight out of a pesticide free garden! 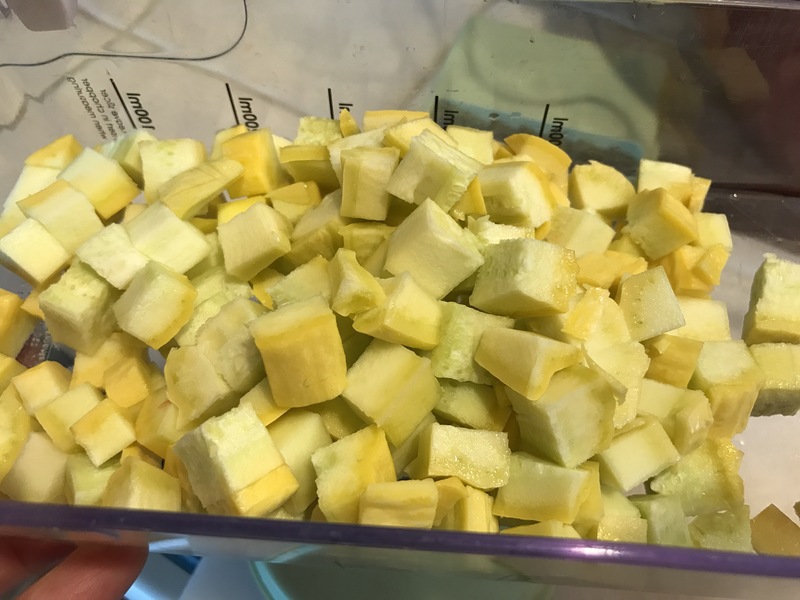 I chopped the squash into 1/4 inch chunks so I could put them through my Vidalia Chopper. I love this chopper so much. It always does a perfect job and it is so FAST and EASY!! I’m all about fast and easy when it comes to cooking! 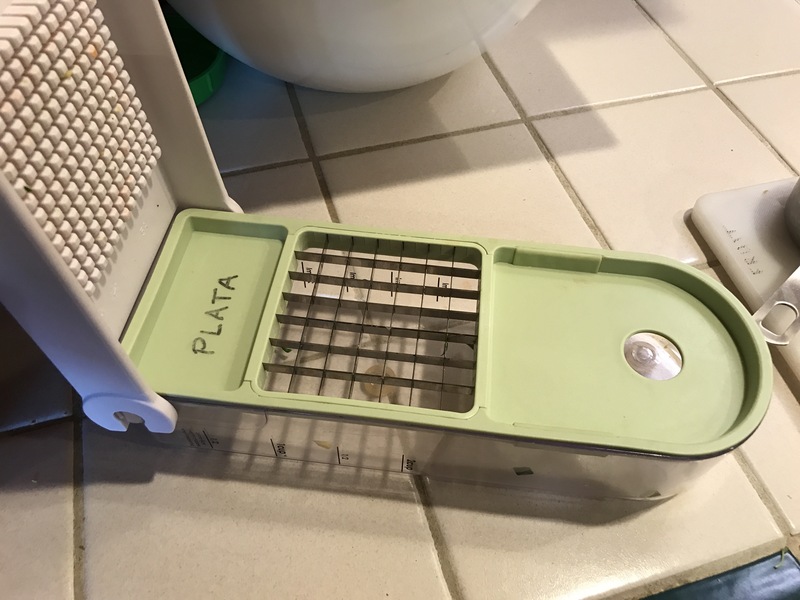 I’m using the larger blade option for this recipe. It cuts perfect little squares every single time! I put both types of squash and my red bell peppers through the chopper. This sight makes me happy because it was effortless to do. Cutting these by hand would be too much work and I’d never want to make this recipe. 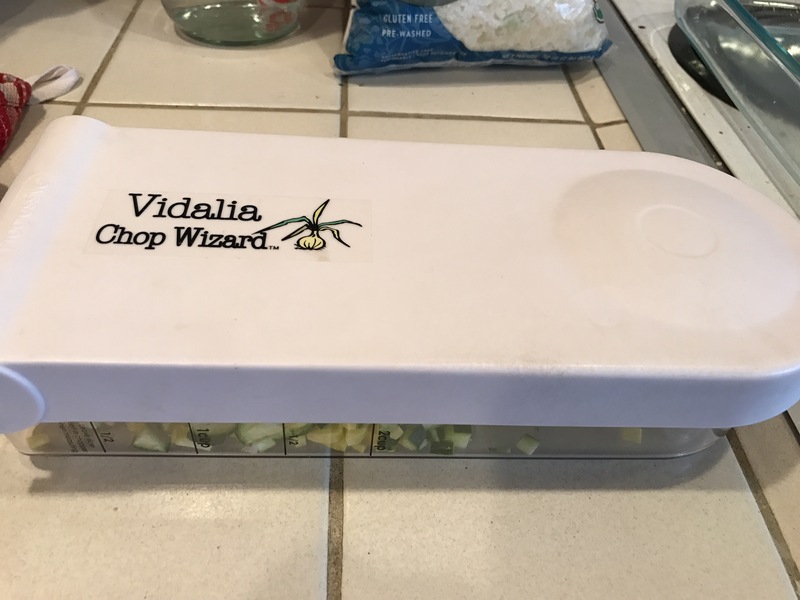 I bought my Vidalia choppers at Target and through eBay. The next ingredient is the Soy Curls. 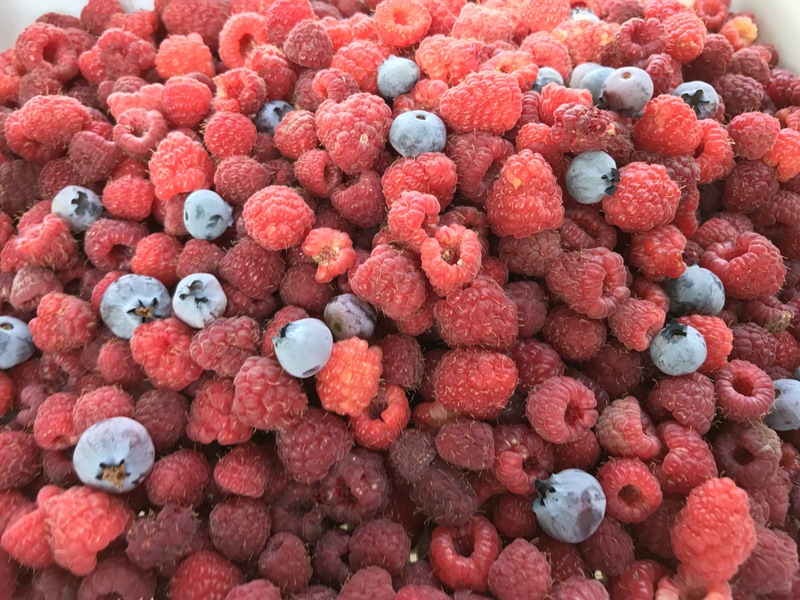 I’ve had some questions about how I prepare these. I always feel like I need to say that I’m not a gourmet cook. I never really even liked cooking, though I’m enjoying it much more now with Bright Line Eating. 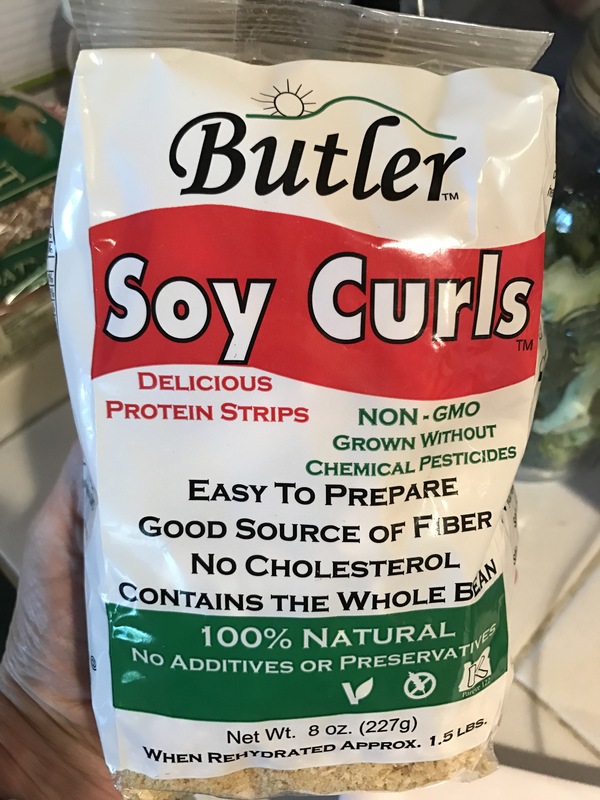 The Soy Curls come in this little bag. I bought them at our church’s health food store. I’m sure a google search would bring up other places where they can be purchased from. They seem to be nothing but soy and they are hard and crisp in the package. Since they are hard and crisp, they must first be rehydrated with water. 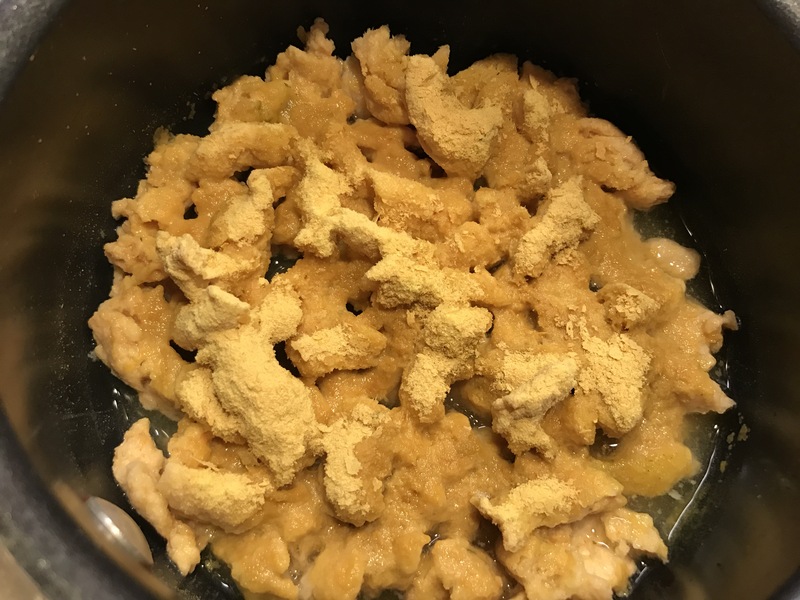 Then I used a veggie chicken style seasoning and some Brewer’s yeast flakes to season them while they soaked up the water. You can season them to taste, using whatever type of seasonings you prefer. They are similar to Tofu with no real taste until you season it. I let those simmer while I prepped my broccoli. 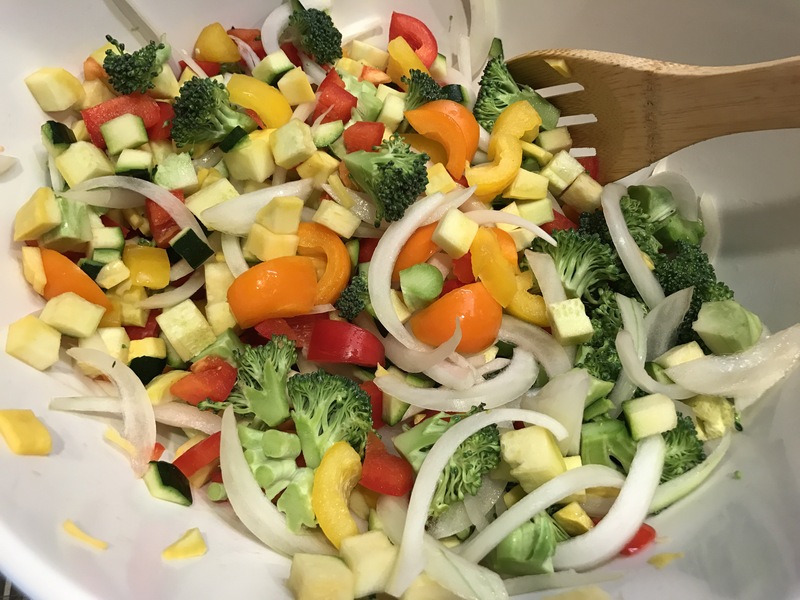 I love seeing all the colors burst and come to life when the veggies all get stirred together! 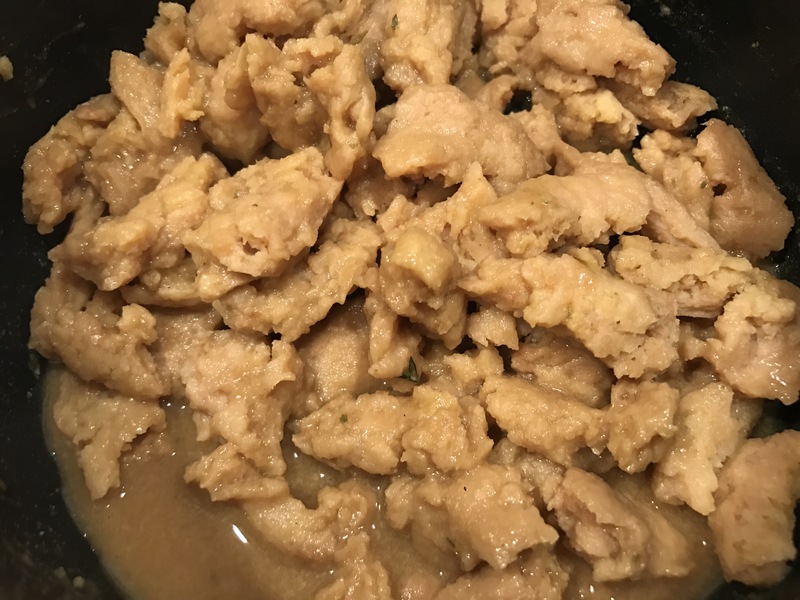 The soy curls have been simmering, soaking up the water, and the excess water has evaporated off with the steam. They are nice and chewy now and soft and “meaty” like! I added the soy curls to the veggies, including the brothy juice. I mixed it all together and put it in a large glass pyrex dish that was sprayed lightly with Pam. 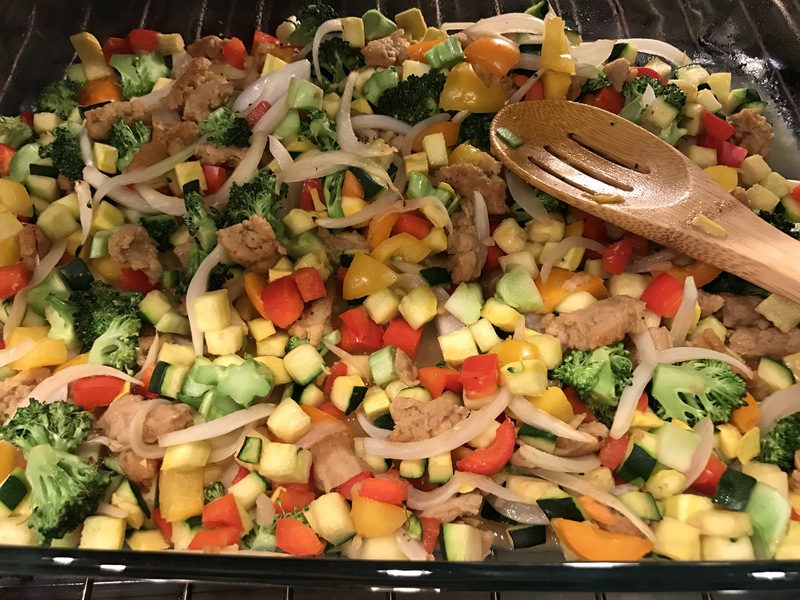 Any type of low pan works well for putting the veggies under the broiler. I always set a timer when food is under the broiler. I’m notorious for walking away and having my food burn under that intense heat. I’ve learned now to set that timer or just stand there and wait for it to be done. This recipe is great for using up whatever veggies you have in the fridge. You can basically put whatever you want into it and it always tastes great! It’s a new week. I feel fantastic and I’m getting a lot of decluttering done here at the house. 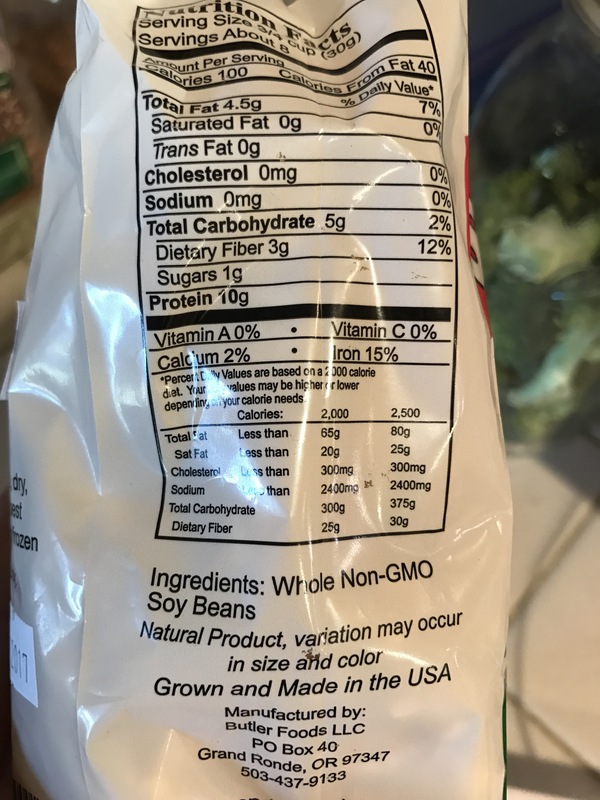 Today my food was spot on except that I thought seeds were 1oz when used as a fat and I discovered that it should have been 0.5 oz. But other than that, my lines were bright and clear today and I enjoyed all of my food! I failed to plan ahead again. Maybe it’s because it’s the weekend. I’ll get back on track because knowing what you’re going to eat gives you a clear path to follow and it’s so much easier!! 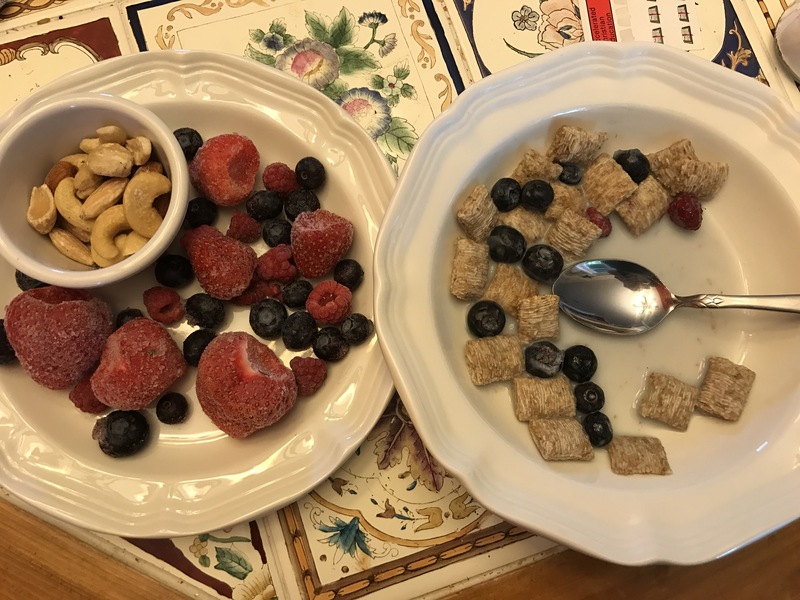 Breakfast was my staple meal of hot cereal, fruit, and nuts. 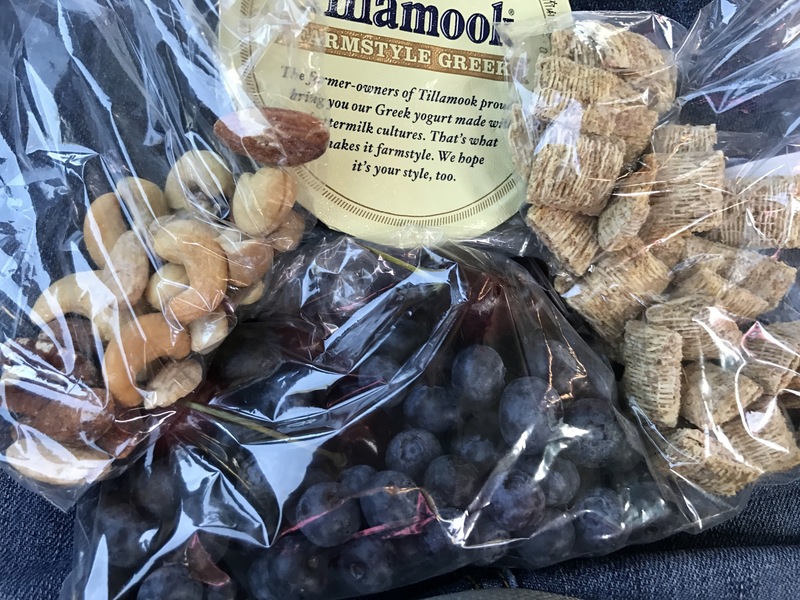 Today I didn’t have milk so I enjoyed more nuts than what I usually have! Lunch found me tired after spending my morning sorting through boxes of papers. It was tedious and taxing work on my brain and since my food wasn’t pre planned, it was all I could do to just put together this ultra simple layout of food. This is the type of lunch I’d pack in a hurry if I had a sack lunch situation. Supper was supposed to be spiralized zucchini with marinara and the taco veggie meat, but I was in town and got home too late to do all that cooking. I actually almost went to Chipotle, but missed the turn off and just came home. 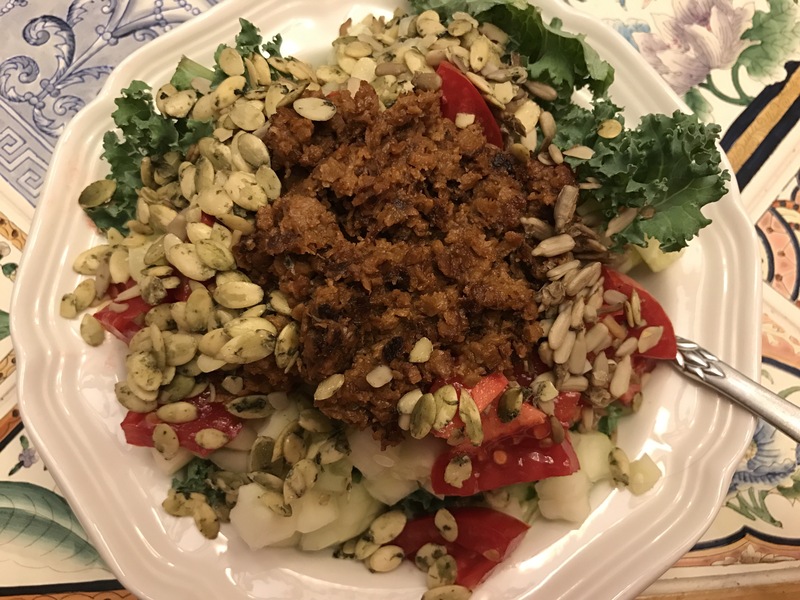 I put together this salad of kale from our garden, cucumber, a tomato from our garden, pumpkin seeds (1 oz instead of 0.5 oz…oops), and I topped it with the “meat”. It was very good and a great way to end my day! I still love this way of life and this morning was a number on the scale that I haven’t seen in over 5 years. It’s all super exciting. I also want to mention that I did 20 push-ups today without stopping and the last ten were not that hard either. I love doing my core exercise rotation and I’m pretty sure I’ll reach my goal of 50 push-ups by my 50th bday on November 16. I feel unstoppable right now and I know it’s just a matter of time before I reach and stay at my goal weight! 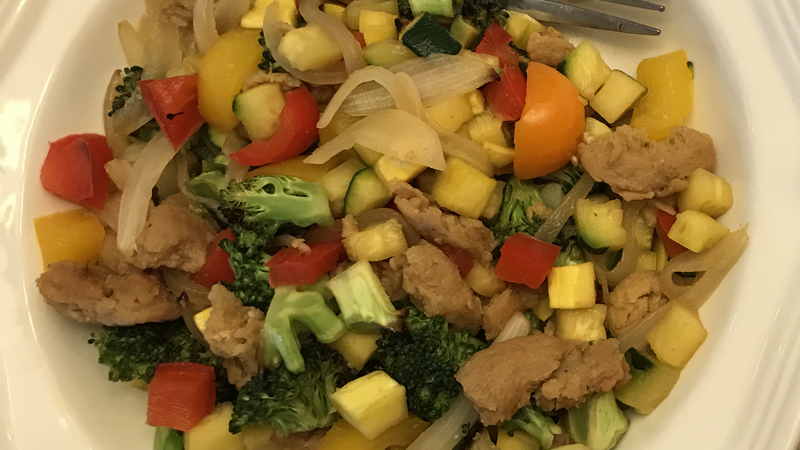 I’m planning to share how I made my grilled veggies and talk a little about the Soy Curls and I also “made” some fruit yogurt that I’ll be having for breakfast tomorrow. I’ll let everyone know if it turned out yummy or not! 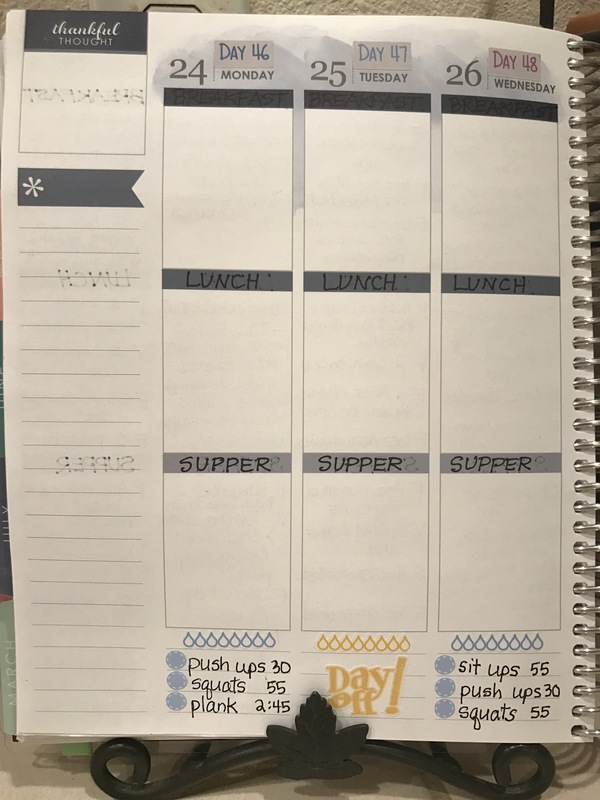 This entry was posted in Bright Line Eating on July 25, 2017 by gracewithouttears. 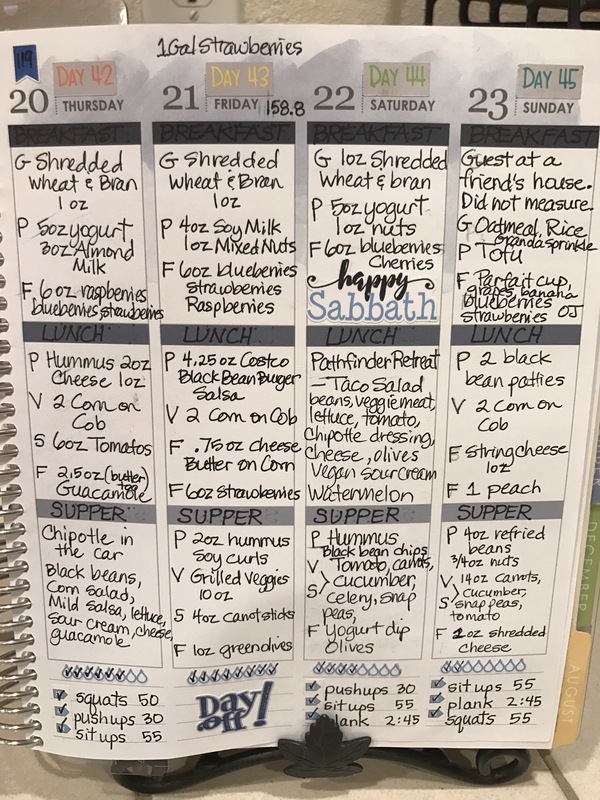 I did not pre plan any of my meals on Sunday, which was my Day 45. 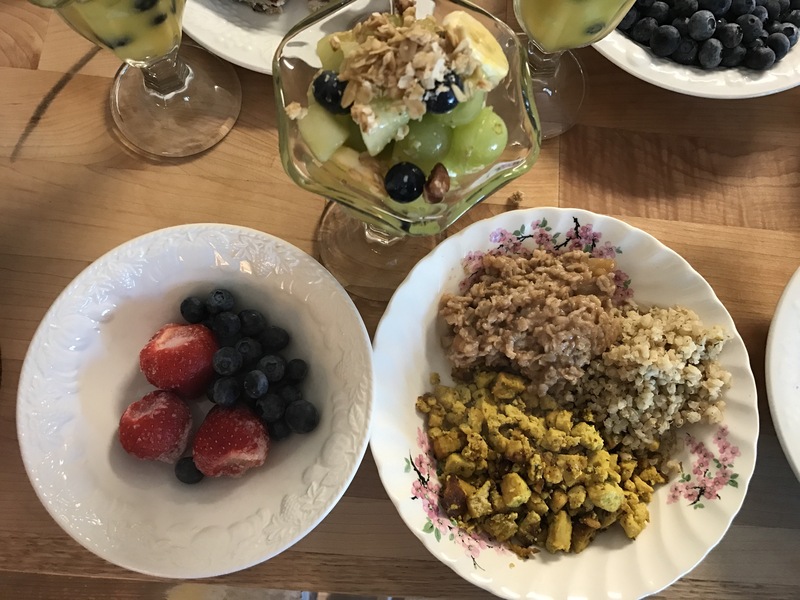 I ate breakfast at my friend’s house because we had to do some planning for Pathfinders and we decided to share brunch before we got down to business. When I’m invited to another person’s house, I do not bring my scale to weigh food. I’m fairly certain my proportions weren’t right on and I think I was over on both grain and fruit. But it was a lovely time and the food was wholesome and delicious. 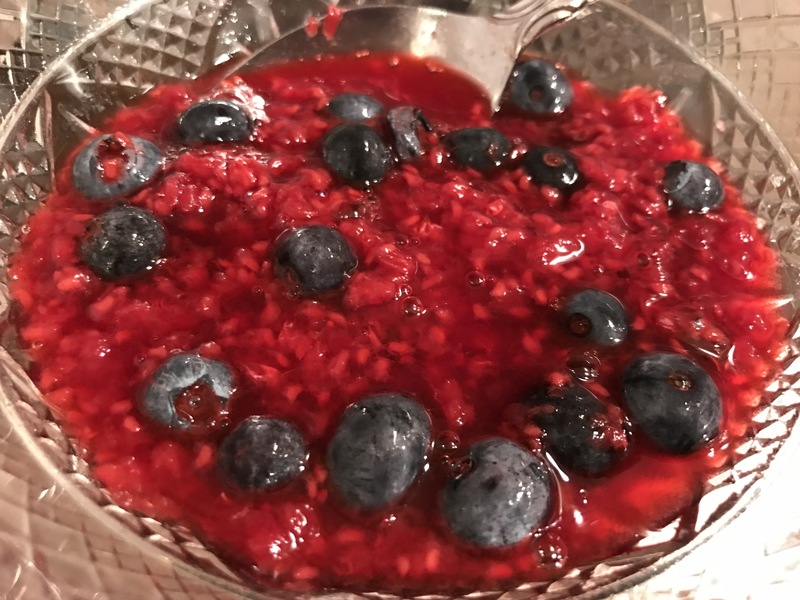 The hostess even made the hot cereal without sugar which was super sweet of her! Lunch was a quick meal at home. 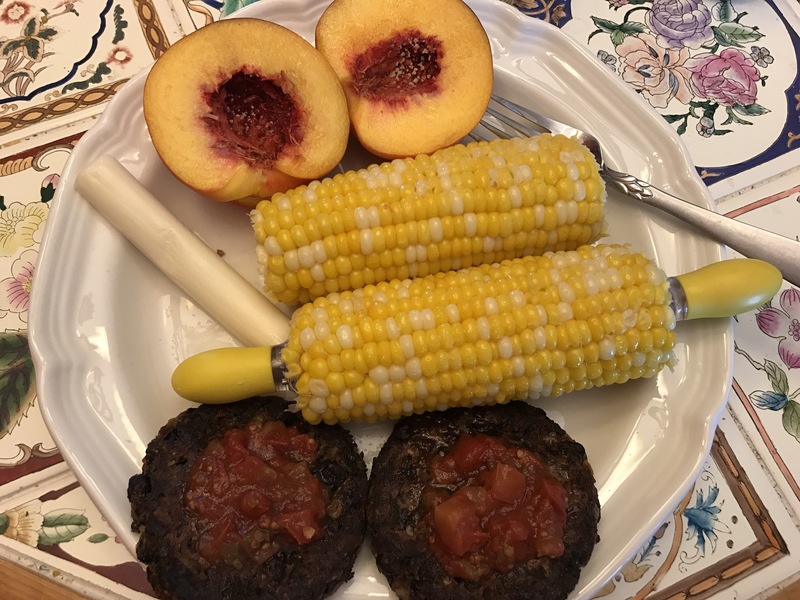 I’m still enjoying my homemade black bean patties with salsa or marinara and these came out of the freezer to be heated up. 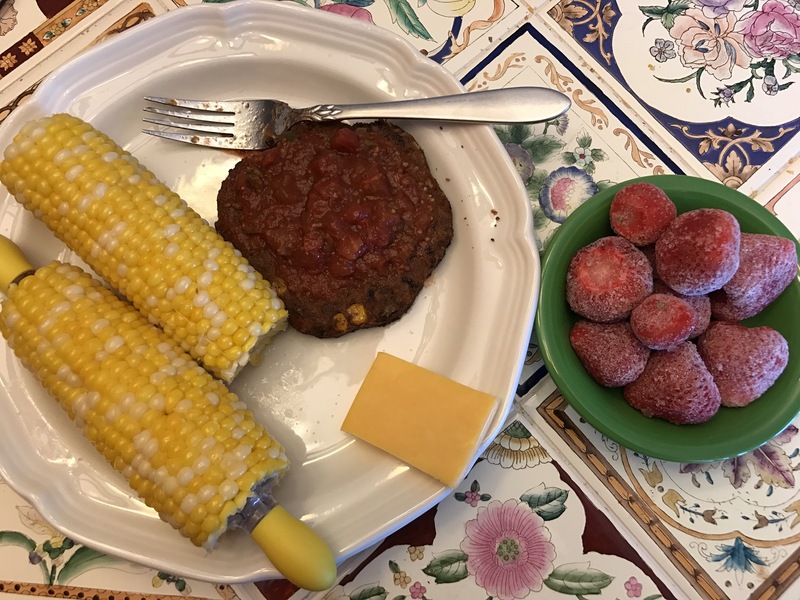 The corn was from Costco and I’ve been enjoying it all week. 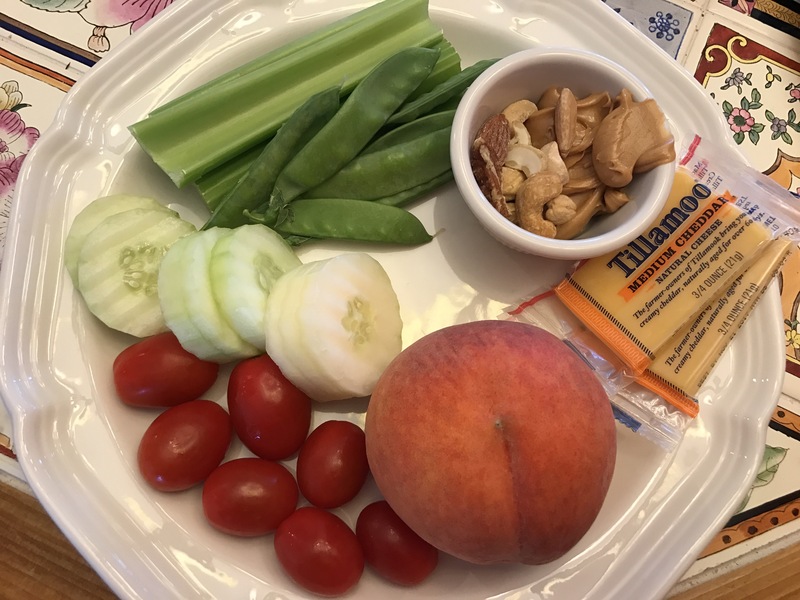 We also had Costco peaches and string cheese is always easy. It’s like a lunch of doubles! I should have cut my cheese in half so there was two of everything! Supper was also somewhat thrown together at home. I wasn’t really hungry and I didn’t feel like cooking so I kept things very simple again. 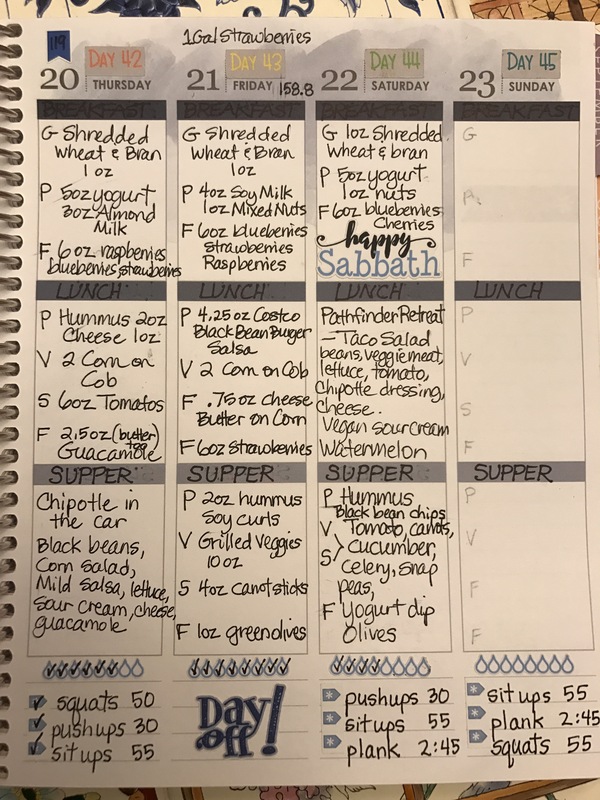 Sunday wraps up the week and my Wellness Journal has served me well for another week of Bright Line Eating!! I was not at home today for any of my meals. I knew what to expect though and still planned my food pretty well. Breakfast was prepped at home and then eaten in the car. Lunch was lakeside and when I’m out and about, I don’t worry about measuring, and I make the best possible choices even if my lines aren’t “perfect”. Life can happen and I’m ok with having some blurry lines now and then. Lunch was absolutely delicious and I would have eaten more but I felt one plateful was enough! I’ll be so glad when I’m on maintenance and I can add potatoes or grain to my other meals. 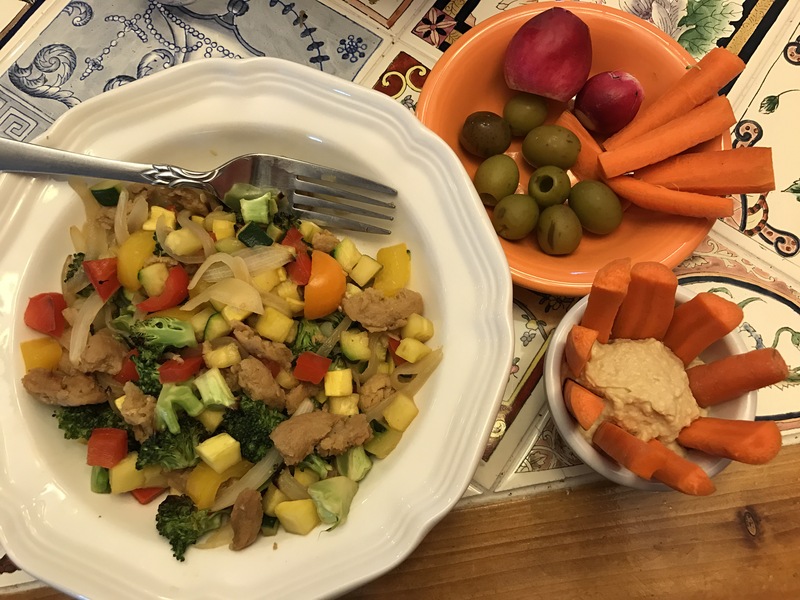 Supper had two fabulous salads that I could have eaten on maintenance, but I just ate what was on the weight loss meal plan. 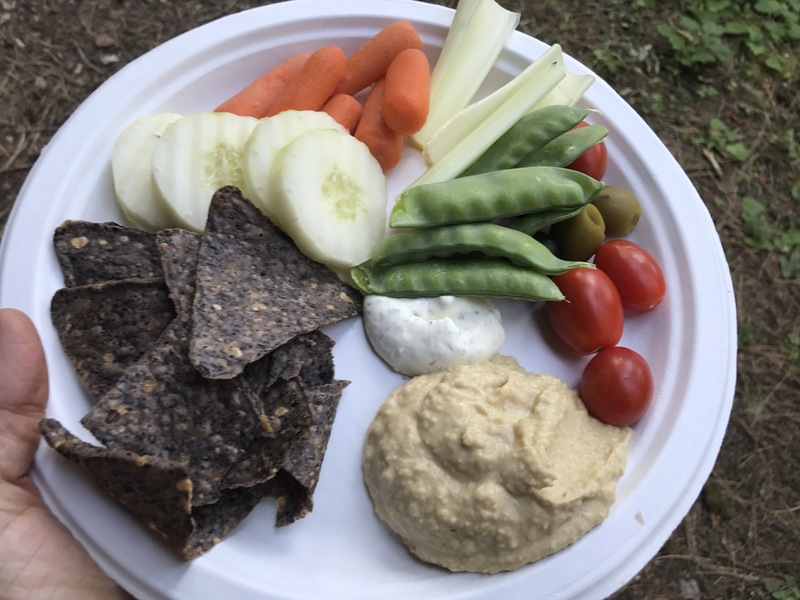 I did have the black bean chips as part of my protein because there were like 3 ingredients (black beans, oil, salt), and my supper was pretty simple. I admit that I did go back for seconds because I was fairly certain that I didn’t have 14oz of veggies on my plate. 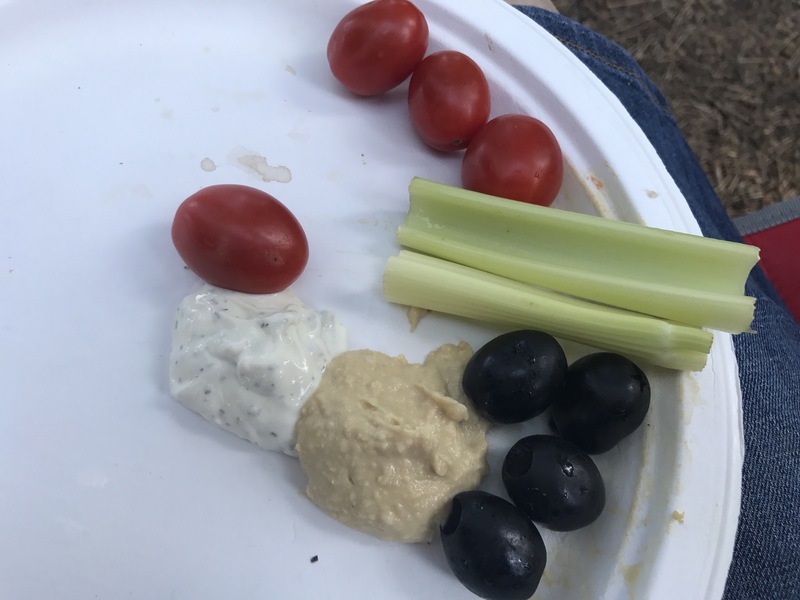 I probably had a little extra fat with a second serving of dip as well, but again, I knew that it would not derail me, and raw veggies aren’t very filling! I’m happy with my food today and I can’t wait for breakfast!! Day 44 is done! This entry was posted in Uncategorized on July 22, 2017 by gracewithouttears. I’m trying something new tonight because this needs to be quick and easy in order for me to keep up with it daily. I will start with a “before” photo. We are looking at Day 43. This has my plan for the day, but in the case of today, I had failed to pre plan my food. Normally, my planned food would be written in pencil. Then I’ll show my meals. And then I’ll show my completed day. This may or may not have the plan penciled in for the following day. This time, it does. 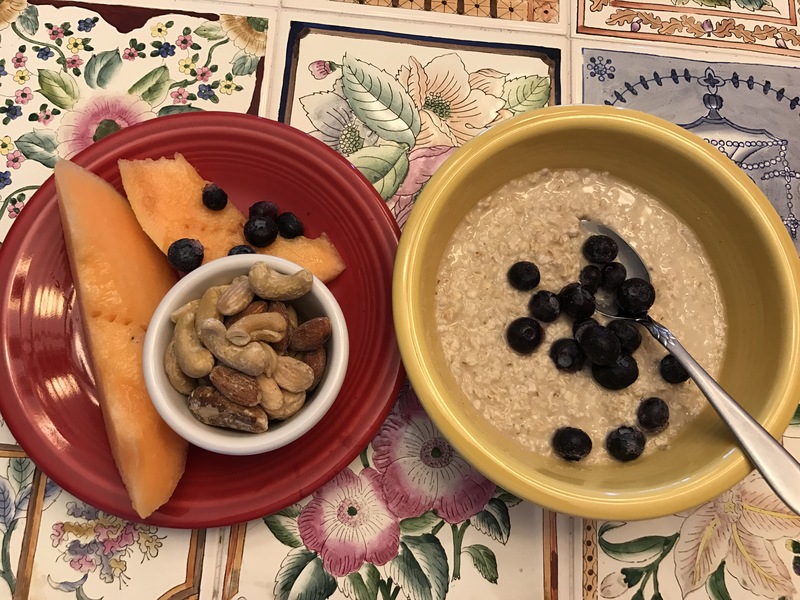 I may say a few words about the food…like that was my staple breakfast again and I plan to repeat it again tomorrow morning! I also was well into eating my cereal before I remembered to snap the photo! Lunch was a throw together quickly meal but it was yummy. I’m also switching my lunch and supper back to the order they’re supposed to be in. I figured I may as well do it now since I was going to do it when school started anyway. I’ll be interested to see if having no fruit at night makes any difference in the speed of my weight loss. Supper was a bit labor intensive but the grilled veggies are so tasty, it’s worth the effort! 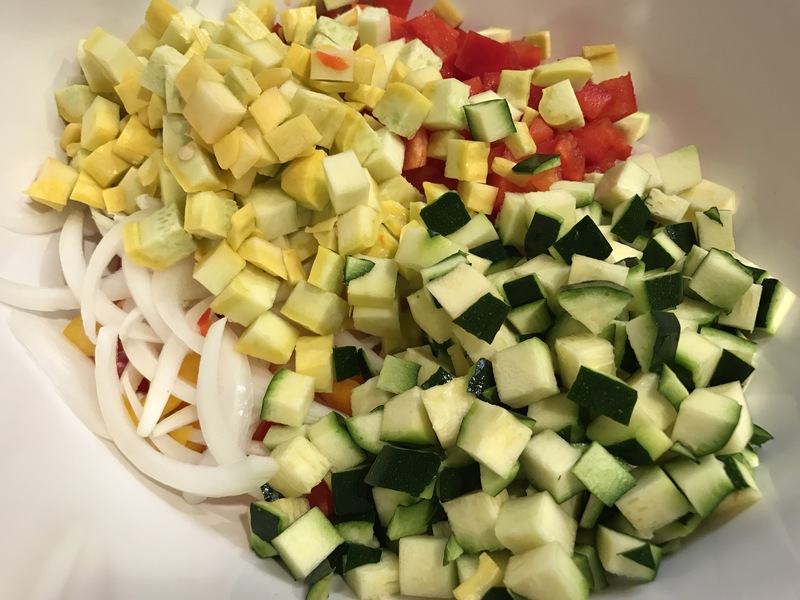 Here’s a quick look at the marinated veggies before they went under the broiler! 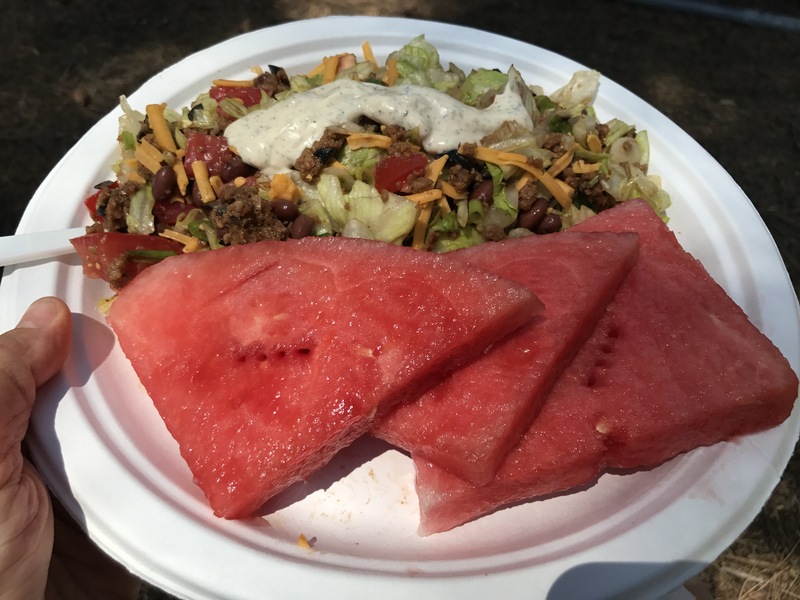 I also might include any other “foodie type things” that happened during the day. 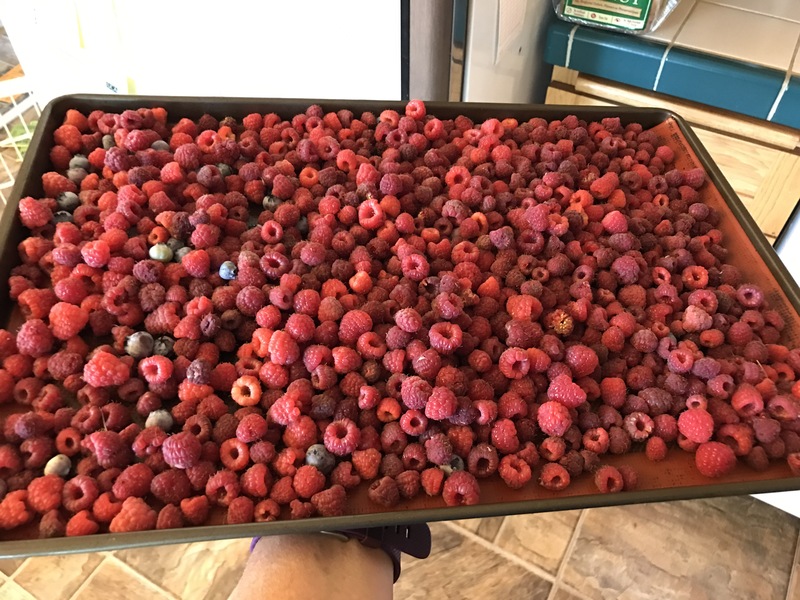 Today I picked and froze raspberries from our garden. They are very small this year because they didn’t get enough water, but I’m getting all that I can! The blueberries are just starting as well. 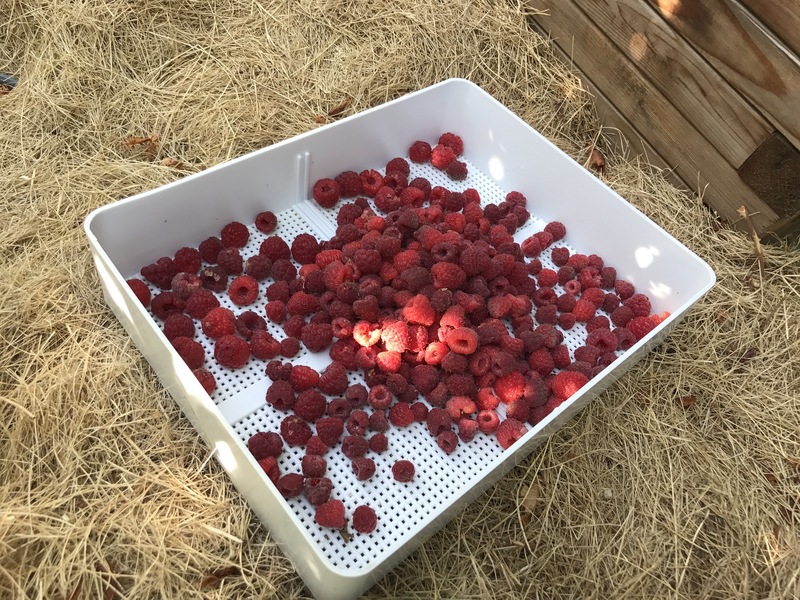 I freeze on trays so they can be bagged and the berries won’t stick together. This makes them very easy to use down the road! Overall it was a successful BLE day!! This entry was posted in Uncategorized on July 21, 2017 by gracewithouttears. I feel like I’m finally getting my act together in life. This year I turn 50. It’s about time. I have flirted with the debt free thing, flirted with healthy eating, struggled with the clutter, nevermind the actual cleaning. A couple years ago I finally just had had it with debt. We had been debt free in our 30’s, INCLUDING the house so we knew what to do. We just got lazy. But I couldn’t live with that burden any longer so I got a part time job and started throwing my money at the debt. It was painful. Seeing thousands of dollars leave my hands and have really nothing to show for it taught me a solid lesson. I knew I never wanted to do this again. We followed the Dave Ramsey Baby Steps and just worked it. We fell off the wagon a bunch of times. But we crawled back on again and again and again. I’m happy to report that in September 2016, we paid our last debt. We could officially do our debt free scream and the burden was released! 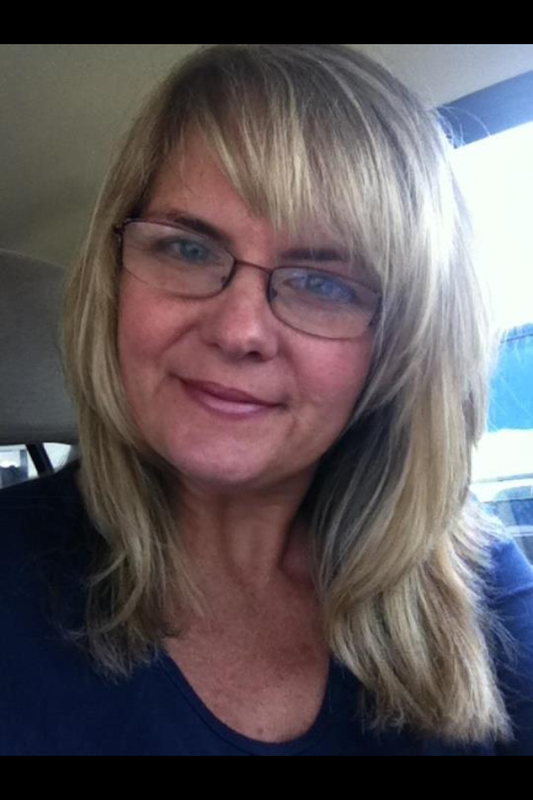 With 10 more months of diligent focus, we finished Baby Step #3 and the new freedom from that is incredible!! So…I (we, but I was the one pushing) got the money in order. That was the beginning of a new way of living. I try to budget, stay within the budget, and only buy what I really need. I still falter sometimes, but the habits have been established and I know I never want to experience that type of debt load again. Next came health. 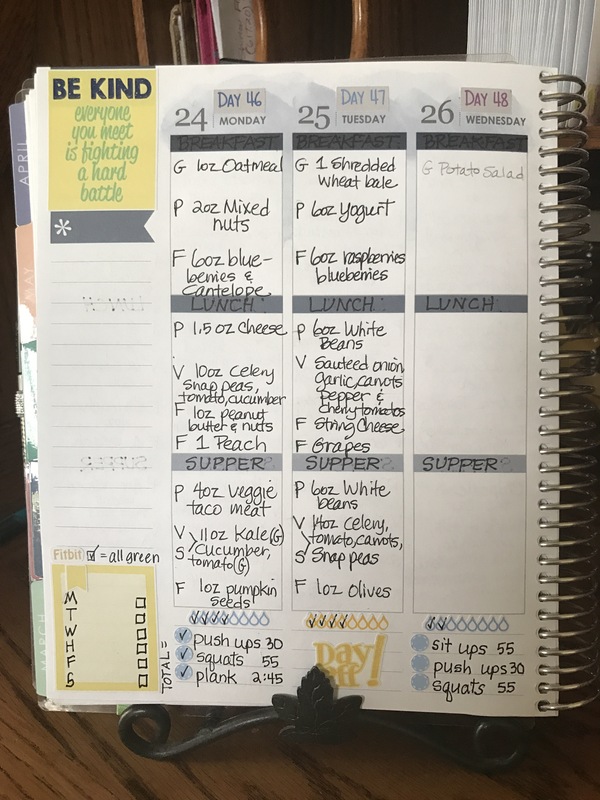 When I discovered Bright Line Eating it was so similar to writing a budget and then spending the budget, it felt right at home. 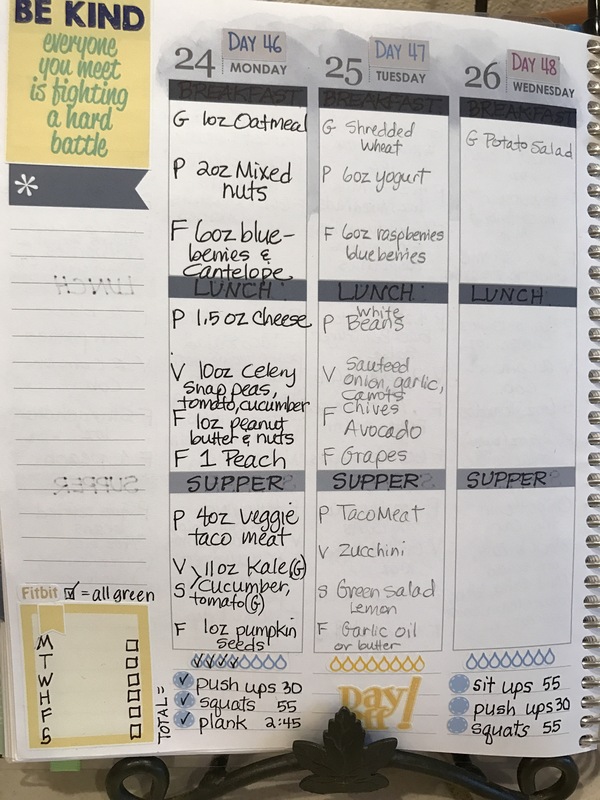 Planning your food the night before is like a budget. Then eating the food as planned is like staying on your budget and spending in all the proper categories. 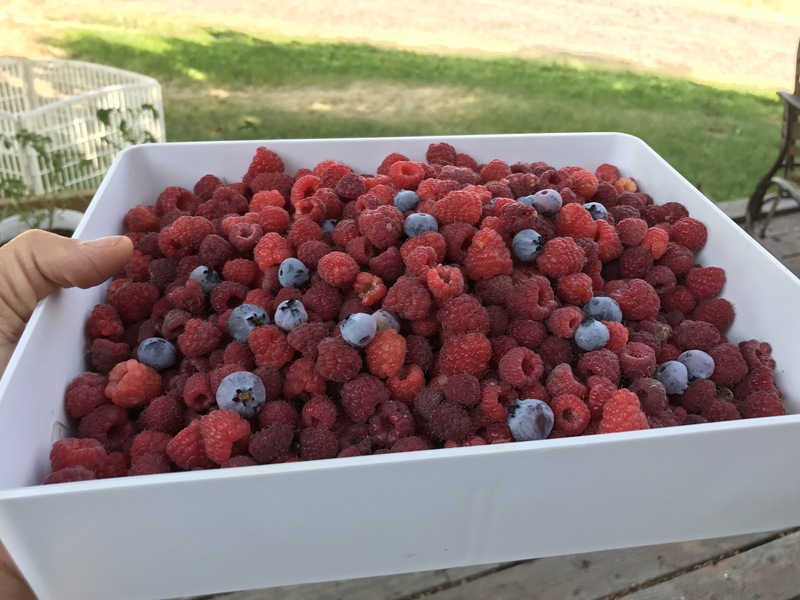 Placing food on a plate that’s measured and fulfills each food category, and then knowing that it’s ok to eat every last morsel is very freeing!! It was simple. It was and is like putting the pieces of a puzzle together and having them all fit!! It’s fun! 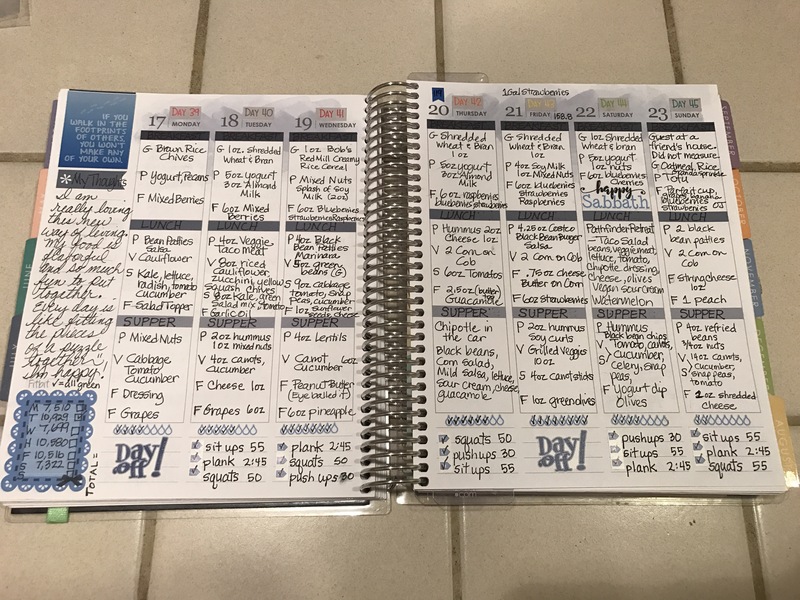 Really fun and after 42 days I feel like I’ve got this area of my life under control now so I can venture into the most difficult area of all (for me)….clutter! What a plague to have stuff everywhere. I’ve filled a whole trailer load (a small one) with trash and unwanted things just this week and I’m sick that it’s all come out of my home. Now to preface that a bit, lest you’re imagining an episode of “Hoarders”, most of it came out of my basement that flooded this spring, and it was stuff from when we moved 5 years ago. I’m dealing with neglect from the past and the process is excruciating. The only redeeming fact is that I have good systems in place now for paper and stuff, so it’s not continuing to pile up, and every item I deal with, I won’t have to look at it again. Money, Health, Stuff. I think many can relate. This is the order of attack that has worked for me. Living “Happy, Thin, and Free” is so much more than just losing weight! I can see light at the end of a long and dark tunnel. I expect the next 50 years (yes, my goal now is to live till I’m 100!!) to be better than the first 50. I have a roadmap. I’ve traveled down the road. And best of all, I’m finally learning to enjoy the journey!! The Best Days Are The Days I Write!